Been thinking about this recently in regards to leadership, church, vision and all that God has for me, for us. We need to be early. We don’t need to innovate. God can do that but we do need to lean in to what He is doing and what He wants to do. Vision and inspiration is never in short supply. It’s people willing to get in on it than prove more difficult. Getting in early takes faith. Taking the first step takes faith. Doing what may seem uncomfortable takes faith. It’s easy to wait and see before you become a part of what God is doing. Getting in early, when we don’t know the outcome, that’s a faith issue. 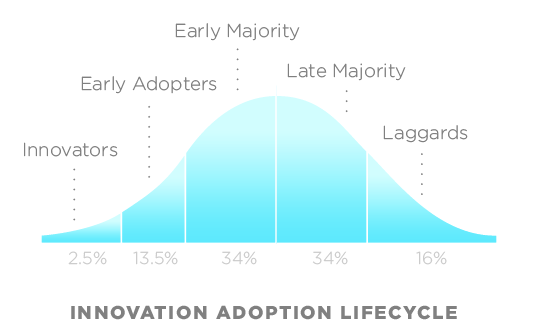 Early adopters position themselves for greater rewards. Most people can wait, can be, as it shows in the diagram, a laggard. I don’t want to be a laggard. Seems like they all miss out and I don’t want to miss out. Early is how God operates. He is never late, always on time, looking to the new thing, ready to move with those who are ready to move with Him. He is a rewarder of those who seek Him and put their trust in Him. For many, when they first find Jesus and become a Christian, amazing things happen. Life changes in dramatic ways. Maybe that is your story. Remember ~ you discovered a new sense of purpose for life, found freedom in God and began to live life according to the truth of God’s word. It was like a whole new world. Some have described that feeling of liberty like seeing in full, high definition colour. The lights have well and truly been switched on. So how’s the journey now? Why is it for some of us as we read this, that life-changing moment just doesn’t seem to have the same effect anymore. The fizz has definitely gone and our walk with God is just a little flat. What caused us to stop believing in the bigness of God? Where did our child-like wonder of all that God can do vanish to? When did we start to fence ourselves in, bring the lines in on what was possible in our lives, and make the boundaries smaller? A narrow view of life may be easier to handle but it’s not the life that Jesus wants us to have. The wider view that God has called us to, a bigger view of life, one that only God can bring about is the one He won for us at the cross. God’s imagination for what our life can be is way bigger than ours. Think about, God told Abraham he would have descendants that were numbered like the stars. Too many to count. That is impossible in the natural. A little scary and overwhelming to most people. what if God shows you something like that, something too big to handle. A God-given view of your life is always bigger than the one you can imagine for yourself. God wouldn’t show us the view if he wasn’t going to help us to handle it. God is in this with Abraham. It’s God’s vision for Abraham which makes it God’s responsibility to make it happen. A wider view is only possible by stepping outside of what we know now, a narrow view. Abraham was made to separate himself from certain constraints. Being inside the tent narrowed is view. he could have looked upward but would have only caught a glimpse of what God was wanting to show him. Sometimes we have to move away from the things that limit what we see. The wider view is built by faith. Abraham had to see it, catch it in his heart and then take a hold of it by faith. If Abraham hadn’t exercised his faith to trust that God could accomplish it, then maybe it wouldn’t have happened. To take God at His word always involves faith. Let this be our attitude as we walk with God, embracing the bigness of all that He has for us now and in the future. It will take faith and a confident trust in God’s ability to accomplish it. Every relationship needs special moments. That first moment when you meet your special someone. That moment when you try and pluck up the courage to talk to her, especially awkward when there is plenty of ‘setting up’ going on by others. The exchange of numbers. The phone call to check they are alright. The next time you are together. A walk around the lake. Holding hands. Talking and talking (and I mean talking). Special moments. Daft stuff really but when you look back you can recognise them as pivotal moments. Those times that make the journey worthwhile and that now, after nearly 21 years of marriage, bring a happy smile to my face. The same is true for my relationship with God. From the moment of realisation that I needed to accept Him for myself and not just because my dad and mum had. Getting baptised. Being filled with the Holy Spirit. Finding myself leaning up against the church organ after coming round from having been overwhelmed by the power of the Holy Spirit. Just learning to appreciate and have an awareness of God’s presence. Incredible moments when the Word of God hits you between the eyes, like they are speaking just to you. Moments. Many moments. Special God encounter moments. You can’t necessarily build a relationship on them alone but they definitely make the journey what it is. Highlights and marker experiences along the way. Proof of someones love for me. Proof to me of God and His interest in me, plain little me. Last Sunday was one of those moments. Unexpected in some sense. A Sunday night service hijacked by the power of God. An awareness of His presence. His peace that goes beyond all understanding. His power moving by the Holy Spirit and working in people’s lives. That never gets old. Here’s the thing I have discovered about such moments. You have to put yourself in the place where they might happen. You have to step out and ask the girl, you have to pursue her, learn to appreciate her and understand how she ticks. There is often a little bit of inconvenience, a little bit of risk, some faith maybe. It’s true with God too. When His people gather together as family, in His House, then anything can happen. You just have to be there to experience it though. I know that God can move in your living room but there is something powerful when Church is filled with believers. That atmosphere of faith, a determined focus on God, without distraction, time set aside to lift up His name and then allowing Him to have His way. Amazing. I can’t make you be there, all I can do is encourage you to position yourself in the place where God encounter moments can take place. It may be difficult, inconvenient or a little bit risk but the step of faith on your part will be so worth it. Let’s actually believe that nothing is impossible for God. Jesus doesn’t turn up when it’s difficult. He turns up when it’s impossible. A wonder is when God goes beyond what we can imagine. We need to recapture the wonder of the Gospel. You don’t leave the presence of God the same way you came in. Self righteous call out for Jesus of Nazareth while the sick call out for Son of David. Self righteous cry out for credit not mercy. To you Jesus is just from Nazareth but for Bartimaeus Jesus was the Son of David. The one who could heal him and the world. Christian is not a sacrifice we make but a sacrifice we trust. We are not called to plant fruit. Repentance is a fruit. Holiness is a fruit. The goodness of God leads to repentance. Grace of God leads us to ungodliness. We are living under a new covenant that says ‘done’. Not under the old one that says ‘do’. Old covenant was conditional ‘if my people’ while Jesus said ‘it is finished’. We don’t live under half a rainbow. Jesus has completed the rainbow. We live under a full rainbow. It’s not ‘if my people’ now it’s ‘only believe’. It’s not how good you are at Spiritual disciplines but how could you are at trusting Jesus. Christians are so afraid of sin. Our focus should be on the finished work of Christ. Where sin abounds grace abounds much more. Old covenant is when clean touched unclean then clean becomes unclean. New covenant is when clean touches unclean then unclean becomes clean. Grace of God operates in the darkest of places. Enjoyed an evening with some of the men from Xcel Church tonight. Pastor John reminded me tonight about the need to show a bit of audacity from time to time. Audacity is important to overcome apathy because it involved faith and faith is the antidote to apathy. Audacious faith is about speaking to situations and not just talking about it. Joshua showed audacious faith when he asked God to stop the sun. That’s definitely out there. Who would even dare ask for such a thing? Yet the encouragement is for me to have my own audacious prayers – relational, spiritual, physical and financial. There is victory in audacity. Actually it doesn’t just work in faith, sometimes it works in other areas of life as it’s about doing something that sometimes doesn’t make sense. Start a new business. Change your financial habits. Turn the TV off. Go for the dream job. Marry that special someone. Join a gym. Love your spouse the right way. Or whatever it might be for you. Where will you put your audacious faith to work? What could you do different that might just change your life? Ever wondered what stopped the individual in Matthew 25 who got given 1 talent from doing anything with it? Don’t know about you but I do not want to be called ‘wicked, lazy, worthless’. Should it concern us that many of us head that way, sometimes without even realising it. If 3 people are given talents and one of them just buries it then does that mean that 1 out of 3 people are doing NOTHING with what God has deposited within them. Am I just busy doing the wrong things? What reasons do I give that limit by ability to take a hold of every opportunity that comes my way? Culture influences image. TV is full of programmes telling us to look right.The cosmetics industry is worth over £37bn in UK – thats BIG business. It’s little wonder that we get concerned about how doing certain things will make us look. Maybe for the person with one talent they became concerned with how doing things would make them look, after all, reputations are precious. They are hard to earn but can be easily lost. There is a danger though for me as a Christian. If I base decisions on image then I put limits on what I can do. If my concern is directed more towards what others might think about me, then perhaps my focus is wrong. Surely my focus should be more on how God sees me. Isn’t acting in faith the better way to go? If you look at God’s view on image He was more concerned with what was going on inside a person’s heart rather than how the outside looked. When King Saul acted because of how things were making him look, it cost him his kingship. While David, who was considered unlikely because he didn’t fit the part was described from God’s perspective as ‘a man after God’s own heart’. Image should not be a reason to stop me but it sometimes it is. Image can override my ability to trust God. Image may stop me stepping out of the things I know and am comfy in, into areas where I don’t know everything. I can’t play not to lose. I need to be more determined to do whatever I can, concerning myself less with how it makes me look and focus more on how it makes God look. That means I MUST exercise my faith in God – after all, he wouldn’t put things in me if he didn’t believe I could handle it.